This form is a real estate purchase contract for the all cash acquisition of a luxury hotel and spa that is flagged with a national hospitality franchise. The agreement features an extensive list of defined terms, and provides for a due diligence review period lasting a specified number of days during which the buyer conducts its due diligence for the purchase. The seller is obligated to furnish extensive documentation concerning the hotel for the buyer's evaluation, including warranties and licenses, financial statements, tax statements, construction drawings, service contracts, governmental notices, and the like. The property is to be sold on a "as-is, where-is" basis. The form also contains extensive representations and warranties by the seller concerning the property, and more modest reps and warranties by the purchaser concerning the purchaser's organization, authority, and approvals to enter into the sale. Other Features Customary Elements of a Real Estate Purchase Agreement Are Included, Including Proration of Taxes, Utilities, and Assignment of Leases and Property Contracts To Purchaser, Etc. 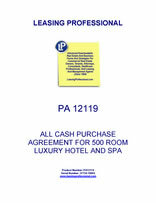 THIS PURCHASE AND SALE AGREEMENT (this “Agreement”) is made and entered into as of this ___ day of _________, 20__ (the “Effective Date”), by and among LUXURY HOTEL OWNER, LLC, a __________ limited liability company (“Seller”), and LUXURY HOTEL BUYER LIMITED PARTNERSHIP, a __________ limited partnership (“Purchaser”). The Seller and Purchaser are sometimes referred to herein individually as a “Party”, and collectively as the “Parties”. WHEREAS, Seller is the fee simple owner of the land and improvements comprising the hotel facility located at __________, and commonly known as the _____________ (the “Hotel”), as more specifically described in this Agreement. WHEREAS, Seller desires to sell the Hotel and the other Property (as hereinafter defined) to Purchaser, and Purchaser desires to purchase the Property from Seller, on the terms set forth in this Agreement. 1.1 Definitions. In addition to the terms defined above in the introduction and recitals to this Agreement, the following terms when used in this Agreement shall have the meanings set forth in this Section 1.1. “Accounts Receivable” means all amounts which Seller is entitled to receive from the Business which are not paid as of the Closing, including charges for the use or occupancy of any guest, conference, meeting or banquet rooms or other facilities at the Hotel, any restaurant, bar or banquet services, or any other goods or services provided by, for or on behalf of Seller at the Hotel, but expressly excluding all items of income otherwise prorated for the benefit of Seller pursuant to Section 11.2. “Adverse Proceeding” has the meaning set forth in Section 9.1.2. “Affiliate” means, with respect to the Person in question, any other Person that, directly or indirectly, (i) owns or controls fifty percent (50%) or more of the outstanding voting and/or equity interests of such Person, or (ii) controls, is controlled by or is under common control with, the Person in question. For the purposes of this definition, the term “control” and its derivations means having the power, directly or indirectly, to direct the management, policies or general conduct of business of the Person in question, whether by the ownership of voting securities, contract or otherwise. “Aging Receivables” has the meaning set forth in Section 11.3.2. “Anti-Terrorism Laws” means Executive Order 13224 issued by the President of the United States, the USA PATRIOT Act, and all other present and future Applicable Law addressing or in any way relating to terrorist acts and acts of war. “Applicable Law” means (i) all statutes, laws, common law, administrative decisions, rules, regulations, ordinances, codes or other legal requirements of any Governmental Authority, stock exchange, board of fire underwriters and similar quasi governmental authority, and (ii) any judgment, injunction, order or other similar requirement of any court or other adjudicatory authority, in effect at the time in question and in each case to the extent the Person or property in question is subject to the same. “Assumed Liabilities” has the meaning set forth in Section 2.3. “Bookings” has the meaning set forth in Section 2.1.16. “Books and Records” has the meaning set forth in Section 2.1.13. “Business” means the lodging business and all activities related thereto conducted at the Hotel, including (i) the rental of any guest, conference, meeting or banquet rooms or other facilities at the Hotel or on the Property, (ii) the operation of any restaurant, bar or banquet services, together with all other goods and services provided at the Hotel, (iii) the rental of any commercial or retail space to tenants at the Hotel or on the Property, (iv) the maintenance and repair of the Real Property and tangible Personal Property, (v) the employment of the Employees by Manager, and (vi) the payment of Taxes. “Business Day” means any day other than a Saturday, Sunday, federal, or State of __________ legal holiday. “Casualty” has the meaning set forth in Section 14.1. “Closing” has the meaning set forth in Section 10.1. “Closing Date” has the meaning set forth in Section 10.1. “Closing Escrow” has the meaning set forth in Section 10.2. “Closing Escrow Agreement” has the meaning set forth in Section 10.2. “Closing Statement” has the meaning set forth in Section 11.1. “Code” means the Internal Revenue Code of 1986, as amended from time to time, and any regulations, rulings and guidance issued by the Internal Revenue Service. “Condemnation” has the meaning set forth in Section 14.2. “Confidential Information” has the meaning set forth in Section 8.1.1. “Contracts” means, collectively, the Equipment Leases and Operating Agreements. “Current Accounts Receivable” has the meaning set forth in Section 11.3.2. “Cut-Off Time” has the meaning set forth in Section 11.1. “Data Room Web Site” has the meaning set forth in Section 4.3.1. “Deed” has the meaning set forth in Section 10.3.1(b). “Due Diligence Contingency” has the meaning set forth in Section 4.1. “Due Diligence Period” has the meaning set forth in Section 4.1. “Earnest Money” means the First Deposit and, once made, the Second Deposit. “Earnest Money Escrow Agreement” has the meaning set forth in Section 3.2.1. “Employees” means all persons employed by the Manager or any of its Affiliates in a full-time or part-time capacity at the Hotel at the time in question, including Union Employees, Non-Union Employees and employees on workers’ compensation, military leave, special military leave, maternity leave, leave under the Family and Medical Leave Act of 1993, union leave, sick lease, short-term or long-term disability, or layoff with recall rights, and employees on other approved leaves of absence with a legal or contractual right to reinstatement. “Employer” means, with respect to any Employee, the Manager. “Employment Agreements” has the meaning set forth in Section 7.1.8. “Environmental Claims” means all claims for reimbursement, remediation, abatement, removal, clean up, contribution, personal injury, property damage or damage to natural resources made by any Governmental Authority or other Person arising from or in connection with the (i) presence or actual or potential spill, leak, emission, discharge or release of any Hazardous Substances over, on, in, under or from the Property, or (ii) violation of any Environmental Laws with respect to the Property. “Environmental Laws” means any Applicable Laws which regulate the manufacture, generation, formulation, processing, use, treatment, handling, storage, disposal, distribution or transportation, or an actual or potential spill, leak, emission, discharge or release of any Hazardous Substances, pollution, contamination or radiation into any water, soil, sediment, air or other environmental media, including (i) the Comprehensive Environmental Response, Compensation and Liability Act, (ii) the Resource Conservation and Recovery Act, (iii) the Federal Water Pollution Control Act, (iv) the Toxic Substances Control Act, (v) the Clean Water Act, (vi) the Clean Air Act, and (vii) the Hazardous Materials Transportation Act, and similar state and local laws, as amended as of the time in question. “Environmental Liabilities” means all liabilities and obligations under any Environmental Laws arising from or in connection with the Property, including any obligations to manage, control, contain, remove, remedy, respond to, clean up or abate any actual or potential spill, leak, emission, discharge or release of any Hazardous Substances, pollution, contamination or radiation into any water, soil, sediment, air or other environmental media. “Environmental Reports” has the meaning set forth in Section 7.1.10. “Equipment Leases” has the meaning set forth in Section 2.1.9. “ERISA” means the Employee Retirement Income Security Act of 1974, as amended from time to time, and the rules and regulations promulgated thereunder. “Exchange Party” has the meaning set forth in Section 3.5. “Excluded F&B” has the meaning set forth in Section 2.2.6. “Excluded IT Systems” has the meaning set forth in Section 2.2.5. “Excluded Property” has the meaning set forth in Section 2.2. “Existing Survey” means that certain survey prepared by ________ dated as of _______, 20__. “F&B” has the meaning set forth in Section 2.1.6. “FF&E” has the meaning set forth in Section 2.1.3. “First Deposit” has the meaning set forth in Section 3.2. “Governmental Authority” means any federal, state or local government or other political subdivision thereof, including any Person exercising executive, legislative, judicial, regulatory or administrative governmental powers or functions, in each case to the extent the same has jurisdiction over the Person or property in question. “Guest Ledger” means all charges accrued to the open accounts of any guests or customers at the Hotel as of the Cut-Off Time for the use or occupancy of any guest, conference or banquet rooms or other facilities at the Hotel, any restaurant, bar or banquet services, or any other goods or services provided by or on behalf of Seller at the Hotel. “Hazardous Substances” means any “hazardous” or “toxic” material as defined in any Environmental Law, including hazardous or toxic substances, materials or waste, whether in solid, semisolid, liquid or gaseous form, including asbestos, petroleum or petroleum by products and polychlorinated biphenyls. “Hospitality Branding” means ________________, a _______ corporation. “Hospitality Branding Entity(ies)” means Hospitality Branding or any of its Affiliates. “Hospitality Branding Proprietary Marks” has the meaning set forth in Section 2.2.2. “Hotel” has the meaning set forth in the Recitals. “Improvements” has the meaning set forth in Section 2.1.2. “Indemnification Cap” has the meaning set forth in Section 15.4.2. “Indemnification Claim” has the meaning set forth in Section 15.5.1. “Indemnification Deductible” has the meaning set forth in Section 15.4.2. “Indemnification Loss” means, with respect to any Indemnitee, any actual (and not contingent) liability, damage (but expressly excluding any consequential and punitive damages), loss, cost or expense, including reasonable attorneys’ fees and expenses and court costs, incurred by such Indemnitee as a result of the act, omission or occurrence in question. “Indemnitee” has the meaning set forth in Section 15.5.1. “Indemnitor” has the meaning set forth in Section 15.5.1. “Inspections” has the meaning set forth in Section 4.2. “Intellectual Property” has the meaning set forth in Section 2.1.12. “Inventoried Baggage” has the meaning set forth in Section 12.2. “Inventoried Safe Deposit Boxes” has the meaning set forth in Section 12.1. “IT Systems” has the meaning set forth in Section 2.1.5. “Knowledge” means (i) with respect to Seller, the actual knowledge of ______________, _________ or __________, without any duty of inquiry or investigation other than as expressly set forth in the proviso below, and expressly excluding the knowledge of any other shareholder, partner, member, trustee, beneficiary, director, officer, manager, employee, agent or representative of Seller or any of its Affiliates; provided, Seller shall submit a copy of the Seller’s representations and warranties contained in this Agreement to the Manager and request that the Manager and the Hotel controller review such representations and warranties and provide a written response to Seller setting forth any exceptions or inaccuracies of such representation and warranties which are known to such persons, and Seller shall provide to Purchaser a copy of any such written response promptly following receipt, and in any event, shall use commercially reasonable efforts to cause Manager to respond prior to the expiration of the Due Diligence Period, provided further however that in no event shall (1) Manager have any recourse or liability for the contents of such response, (2) the delivery or non-delivery of such response be a condition precedent to Purchaser’s obligations under this agreement and (3) Seller be deemed to have made any representation or warranty as to the accuracy of such written response, and the knowledge of such persons shall not be imputed to Seller, except to the extent of any information expressly contained in such written response; and (ii) with respect to Purchaser, (A) the actual knowledge of __________, __________, __________,__________ and _______ and expressly excluding the knowledge of any other shareholder, partner, member, trustee, beneficiary, director, officer, manager, employee, agent or representative of Purchaser or any of its Affiliates, (B) any matter disclosed in any exhibits or schedules to this Agreement, (C) any matter disclosed in any Seller Due Diligence Materials or any other documents or materials provided by Seller to Purchaser prior to Closing, and (D) any matter disclosed by the Inspections or in the Purchaser Due Diligence Reports. For the purposes of this definition, the term “actual knowledge” means, with respect to any natural person, the conscious awareness of such person at the time in question, and expressly excludes any constructive or implied knowledge of such person. “Land” has the meaning set forth in Section 2.1.1. “Liability” means any liability, obligation, damage, loss, diminution in value, cost or expense of any kind or nature whatsoever, whether accrued or unaccrued, actual or contingent, known or unknown, foreseen or unforeseen. “Licenses and Permits” has the meaning set forth in Section 2.1.11. “Liquor Licenses” has the meaning set forth in Section 8.3. “Management Agreement” means that certain Management Agreement dated as of ________, by and between Seller (as successor-in-interest to the original party thereto) and Manager, as amended. “Management Agreement Estoppel” has the meaning given to such term in Section 9.2.1(e). “Manager” means ________, a __________ limited partnership. “Material Casualty” has the meaning set forth in Section 14.1.1. “Material Condemnation” has the meaning set forth in Section 14.2.1. “Material Contract” means any Contract requiring in any one calendar year after the Closing, but during the term of such Contract, aggregate payments in excess of Fifty Thousand Dollars ($50,000). “Mutual Closing Conditions” has the meaning set forth in Section 9.1.1. “National/Regional Operating Agreements” has the meaning set forth in Section 2.2.3. “Non-Union Employees” means those Employees that are not Union Employees. “Notice” has the meaning set forth in Section 16.1.1. “Ongoing Capital Work” has the meaning set forth in Section 8.16. “Operating Agreements” has the meaning set forth in Section 2.1.10. “Operating Lessee” means an Affiliate of Purchaser that may lease a portion of the Property from Purchaser pursuant to an operating lease. “Ordinary Course of Business” means the ordinary course of business consistent with Seller’s past custom and practice for the Business, taking into account the facts and circumstances in existence from time to time. “Pending Receivables” has the meaning set forth in Section 11.3.2. “Permitted Exceptions” has the meaning set forth in Section 5.3.1. “Person” means any natural person, corporation, general or limited partnership, limited liability company, association, joint venture, trust, estate, Governmental Authority or other legal entity, in each case whether in its own or a representative capacity. “Personal Property” means the Property other than the Real Property. “Plan” means an “employee benefit plan” as defined in Section 3(3) of ERISA or Section 4975 of the Code. “Plans and Specifications” has the meaning set forth in Section 2.1.14. “Post-Execution Disclosure” has the meaning set forth in Section 16.13. “Pre-Closing Access” has the meaning set forth in Section 8.12. “Prime Rate” means the rate of interest published in the Wall Street Journal from time to time as the prime rate of interest, changing simultaneously and automatically with each announced change in said rate. In the event the Wall Street Journal ceases to publish a prime rate of interest, the Prime Rate shall be determined by reference to another publication, as Seller may reasonably select, that publishes a prime rate of interest. “Property” has the meaning set forth in Section 2.1. “Prorations” has the meaning set forth in Section 11.2. “Purchase Price” has the meaning set forth in Section 3.1. “Purchaser” has the meaning set forth in the Recitals. “Purchaser Closing Conditions” has the meaning set forth in Section 9.2. “Purchaser Closing Deliveries” has the meaning set forth in Section 10.3.2. “Purchaser Cure Period” has the meaning set forth in Section 13.9. “Purchaser Default” means a material breach or default by Purchaser in any of its representations, warranties, covenants or obligations under this Agreement, to the extent such breach or default is not caused by a Seller Default and (except for a breach or default under Sections 3.2.1, 3.3 and 16.4, or a failure to make any material delivery set forth in Section 10.3.2 required to be made by Purchaser at Closing, which in each case shall have the cure period set forth in Section 13.9) which breach or default is not cured within ten (10) Business Days after Purchaser’s receipt of written notice of such breach or default from Seller. “Purchaser Default or Failure” has the meaning set forth in Section 13.9. “Purchaser Documents” has the meaning set forth in Section 7.2.2. “Purchaser Due Diligence Reports” has the meaning set forth in Section 4.4. “Purchaser Indemnitees” means Purchaser and its Affiliates, and each of their respective shareholders, members, partners, trustees, beneficiaries, directors, officers and employees, and the successors, permitted assigns, legal representatives, heirs and devisees of each of the foregoing. “Purchaser’s Inspectors” has the meaning set forth in Section 4.2. “Purchaser’s Lender” means any lender(s) selected by Purchaser to provide financing for Purchaser’s acquisition of the Property. “Real Property” has the meaning set forth in Section 2.1.2. “Required Removal Exceptions” means (i) any mortgages, deeds of trust or other security instruments for any financing (other than those caused by Purchaser or any of its Affiliates), (ii) Taxes which are due and payable as of Closing (but if a portion of such Taxes relate to a period subsequent to Closing, the foregoing will have no affect on the obligation to apportion such Taxes pursuant to Article 11), (iii) any exception to title which Seller or any Affiliate of Seller willfully creates in breach of this Agreement and (iv) any other Title Exceptions which may be removed by payment of an ascertainable and liquidated amount, which in the aggregate does not exceed Five Hundred Thousand Dollars ($500,000.00). “Retail Merchandise” has the meaning set forth in Section 2.1.7. “Retained Liabilities” has the meaning set forth in Section 2.4. “Scheduled Closing Date” means the date on which the Closing is scheduled to occur as the same may be postponed pursuant to the terms of this Agreement. “Second Deposit” has the meaning set forth in Section 3.2. “Seller” has the meaning set forth in the Recitals. “Seller Closing Conditions” has the meaning set forth in Section 9.3. “Seller Closing Deliveries” has the meaning set forth in Section 10.3.1. “Seller Cure Period” has the meaning set forth in Section 13.8. “Seller Default” means a material breach or default by Seller in any of its representations, warranties, covenants or obligations under this Agreement, to the extent such breach or default is not caused by a Purchaser Default and (except for the failure to make any material delivery set forth in Section 10.3.1 which is required to be made by Seller at Closing, which shall have the cure period set forth in Section 13.8) which breach or default is not cured within ten (10) Business Days after Seller’s receipt of written notice of such default from Purchaser. “Seller Default or Failure” has the meaning set forth in Section 13.8. “Seller Documents” has the meaning set forth in Section 7.1.2. “Seller Due Diligence Materials” has the meaning set forth in Section 4.3.1. “Seller Indemnitees” means Seller and its Affiliates, and each of their respective shareholders, members, partners, trustees, beneficiaries, directors, officers and employees, and the successors, permitted assigns, legal representatives, heirs and devisees of each of the foregoing. “Seller’s Possession” means in the physical possession of (a) any officer or employee of Seller or any of its Affiliates that has primary responsibility for the Business or (b) the Manager, to the extent that Manager has, pursuant to a request that Seller agrees to make, agreed to provide Seller with requested documents or materials or to the extent that Seller has the right under the Management Agreement to obtain relevant documents or materials without incurring any material costs; provided, however, that any reference in this Agreement to Seller’s Possession of any documents or materials expressly excludes the possession of any such documents or materials that (i) are legally privileged or constitute attorney work product, (ii) are subject to a confidentiality agreement or to Applicable Law prohibiting their disclosure, or (iii) constitute confidential internal assessments, reports, studies, memoranda, notes or other correspondence prepared by or on behalf of any officer or employee of Seller or any of its Affiliates and not delivered to any third party (other than a third party which is bound by a confidentiality agreement or other confidentiality obligation). “Subsequent Taxable Period” has the meaning set forth in Section 8.6.1. “Supplies” has the meaning set forth in Section 2.1.4. “Survey” has the meaning set forth in Section 5.2. “Survey Defects” has the meaning set forth in Section 5.3.2. “Survival Period” has the meaning set forth in Section 15.1.2. “Tax-Free Exchange” has the meaning set forth in Section 3.5. “Taxes” means any federal, state, local or foreign, real property, personal property, sales, use, room, occupancy, ad valorem or similar taxes, assessments, levies, charges or fees imposed by any Governmental Authority on Seller with respect to the Property or the Business, including any interest, penalty or fine with respect thereto, but expressly excluding any (i) federal, state, local or foreign income, capital gain, gross receipts, capital stock, franchise, profits, estate, gift or generation skipping tax, or (ii) transfer, documentary stamp, recording or similar tax, levy, charge or fee incurred with respect to the transaction described in this Agreement. “Tenant Leases” has the meaning set forth in Section 2.1.8. “Third-Party Claim” means, with respect to the Person in question, any claim, demand, lawsuit, arbitration or other legal or administrative action or proceeding against the Person in question by any other Person which is not an Affiliate of the Person in question. “Title and Survey Election Notice” has the meaning set forth in Section 5.3.2. “Title and Survey Objection Notice” has the meaning set forth in Section 5.3.2. “Title and Survey Response Notice” has the meaning set forth in Section 5.3.2. “Title Commitment” has the meaning set forth in Section 5.1. “Title Company” means the Escrow Agent or such other national title insurer as Purchaser may select. “Title Exceptions” has the meaning set forth in Section 5.3.2. “Title Policy” has the meaning set forth in Section 5.4. “Trade Payables” has the meaning set forth in Section 11.2.12. “Union Contract” has the meaning set forth in Section 2.1.20. “Union Employees” means any Employees whose employment is subject to the terms of the Union Contract. “Unpermitted Exceptions” has the meaning set forth in Section 5.3.1. “WARN Act” means the Worker’s Adjustment and Retraining Notification Act, 29 U.S.C. § 2101, et seq., and any similar state and local laws, as amended from time to time, and any regulations, rules and guidance issued pursuant thereto. “Warranties” has the meaning set forth in Section 2.1.15. 1.2.1 Singular words shall connote the plural as well as the singular, and plural words shall connote the singular as well as the plural, and the masculine shall include the feminine and the neuter, as the context may require. 1.2.2 All references in this Agreement to particular articles, sections, subsections or clauses (whether in upper or lower case) are references to articles, sections, subsections or clauses of this Agreement. All references in this Agreement to particular exhibits or schedules (whether in upper or lower case) are references to the exhibits and schedules attached to this Agreement, unless otherwise expressly stated or clearly apparent from the context of such reference. 1.2.3 The headings in this Agreement are solely for convenience of reference and shall not constitute a part of this Agreement nor shall they affect its meaning, construction or effect. 1.2.4 Any reference to any agreement (including this Agreement), document, instrument, tax or tariff means such agreement, document, instrument, tax or tariff as amended or modified in effect from time to time in accordance with the terms thereof, and if applicable the terms hereof. 1.2.5 The terms “hereby,” “hereof,” “hereto,” “herein,” “hereunder” and any similar terms shall refer to this Agreement, and not solely to the provision in which such term is used. 1.2.7 The term “sole discretion” with respect to any determination to be made a Party under this Agreement means the sole and absolute discretion of such Party, without regard to any standard of reasonableness or other standard by which the determination of such Party might be challenged. 1.2.8 Seller, Purchaser and their respective counsel have reviewed and revised (or requested revisions of) this Agreement and have participated in the preparation of this Agreement, and therefore any rules of construction requiring that ambiguities are to be resolved against the Party which drafted the Agreement or any exhibits hereto shall not be applicable in the construction and interpretation of this Agreement or any exhibits hereto. 2.1.18 Vehicles. All vehicles owned or leased by Seller which serve the Hotel, as set forth on Schedule 2.1.18. 2.1.19 Management Agreement. The Management Agreement. 2.1.20 Union Contract. That certain Collective Bargaining Agreement, by and between ___________ and ____________, __________ and ________ Local _______, dated as of ___________ (the “Union Contract”). For purposes of this Section 2.1, the IT Systems, the Tenant Leases and the security deposits thereunder, the Equipment Leases and deposits thereunder, the Operating Agreements and deposits thereunder, the Warranties, the Plans and Specifications, and the Licenses and Permits where the terms “assignable” or “transferable” mean such items under which assignment or transfer is permitted without the consent or approval of any Person other than Seller or any of its Affiliates. Purchaser, at its cost and expense (subject to the proviso below), shall be responsible for obtaining, to the extent required for the continuation of the Business, the transfer or replacement of all IT Systems, the Equipment Leases and deposits thereunder, the Operating Agreements and deposits thereunder. 2.2.6 Excluded F&B. Any alcoholic beverages to the extent the sale or transfer of the same as contemplated in this Agreement is not permitted under Applicable Law (the “Excluded F&B”). 2.2.7 Employment Contracts. Any employment contracts between Employer and Employees. 2.3 Assumed Liabilities. At Closing, Purchaser shall assume all Liabilities arising from, relating to or in connection with the Property or the Hotel, including all Liabilities with respect to the condition of the Property, first arising on or after the Closing, subject to Seller’s express representations and warranties in Section 7.1, including any such Liabilities relating to the design, construction, engineering, maintenance and repair or environmental condition of the Property arising on or after the Closing, but expressly excluding the Retained Liabilities (the “Assumed Liabilities”). 2.4 Retained Liabilities. At Closing, Seller shall retain all Liabilities for (i) the payment of any amounts due and payable or accrued but not yet due or payable prior to the Closing Date under the Tenant Leases, the Management Agreement (with the agreement that any amounts payable under the Union Contract by virtue of the Management Agreement shall be covered by clause (ii) below), Contracts and Licenses and Permits, except to the extent Purchaser has received a credit for and in the amount of such Liabilities under Section 11.2, (ii) the payment of any amounts due and payable (meaning then due and payable under the terms of the Union Contract but excluding any payment or contribution for any actual or alleged “unfunded liability” under the Union Contract with respect to a multi-employer pension plan (including any withdrawal liability assessed with respect to any multi-employer pension plan to which contributions are made pursuant to the Union Contract)) prior to the Closing Date under the Union Contract, except to the extent Purchaser has received a credit for and in the amount of such Liabilities under Section 11.2, (iii) the payment of all Taxes due and payable or accrued but not yet due or payable prior to the Closing, except to the extent Purchaser has received a credit for and in the amount of such Taxes under Section 11.2, and (iv) all other Liabilities arising from, relating to or in connection with the Property or the Hotel based on any event which occurred at the Hotel prior to the Closing Date, including the litigation disclosed on Schedule 7.1.7 (the “Retained Liabilities”). 3.1 Purchase Price. The purchase price for the Property is _______________ Million and no/100 Dollars ($___________) (the “Purchase Price”), which shall be adjusted at Closing for the Prorations pursuant to Section 11.2, the Accounts Receivable pursuant to Section 11.3, and as otherwise expressly provided in this Agreement. 3.2.1 Deposit of Earnest Money. Purchaser shall on or before the Business Day following the Effective Date deposit the amount of __________ and no/100 Dollars ($_____________) (the “First Deposit”) with Escrow Agent which is held in a strict joint order escrow as earnest money pursuant to that certain Earnest Money Escrow Agreement, dated as of _________, 20__, among Seller, Purchaser and Escrow Agent in the form of Exhibit A (the “Earnest Money Escrow Agreement”). If Purchaser terminates this Agreement pursuant to the Due Diligence Contingency in accordance with Article 4, the Earnest Money shall be refunded to Purchaser in accordance with Section 3.2.4 and the Earnest Money Escrow Agreement. If Purchaser does not desire to terminate this Agreement pursuant to the Due Diligence Contingency, then Purchaser shall be obligated to deposit with Escrow Agent on the Business Day following the end of the Due Diligence Period an additional ___________ and 00/100 ($___________) (the “Second Deposit”) to be held pursuant to the Earnest Money Escrow Agreement and the Earnest Money shall be non refundable to Purchaser, except as otherwise expressly provided in this Agreement. 3.2.2 Investment of Earnest Money. The Earnest Money shall be invested in accordance with the Earnest Money Escrow Agreement. 3.2.3 Disbursement of Earnest Money to Seller. At Closing, Purchaser and Seller shall direct Escrow Agent to disburse the Earnest Money to Seller, and Purchaser shall receive a credit against the Purchase Price in the amount of the Earnest Money so disbursed to Seller. If this Agreement is terminated and Seller is entitled to the Earnest Money under an express provision of this Agreement, then Purchaser and Seller shall provide a written direction to Escrow Agent to disburse the Earnest Money to Seller no later than two (2) Business Days after such termination. 3.2.4 Refund of Earnest Money to Purchaser. If this Agreement is terminated and Purchaser is entitled to a refund of the Earnest Money under an express provision of this Agreement, then Seller and Purchaser shall provide a written direction to Escrow Agent to disburse the Earnest Money to Purchaser no later than two (2) Business Days after such termination. 3.3 Payment of Purchase Price. 3.3.1 Payment at Closing. At Closing, Purchaser shall pay to Escrow Agent for payment to Seller by wire transfer of immediately available funds an amount equal to the Purchase Price (as adjusted pursuant to Section 3.1), less the Earnest Money disbursed to Seller. Purchaser shall cause the wire transfer of funds to be received by Seller no later than 1:00 p.m. (Eastern Time) on the Closing Date. In the event that the Purchase Price (as adjusted pursuant to Section 3.1) is not yet determined at 12:00 p.m. (Eastern Time), Purchaser shall wire transfer an amount that it estimates in good faith to be the amount of the Purchase Price (as adjusted pursuant to Section 3.1) less the Earnest Money disbursed to Seller, and the Purchaser and Seller shall make the requisite adjustments on the immediately following Business Day in order that the amount paid by Purchaser to Seller equals the amount of the Purchase Price (as adjusted pursuant to Section 3.1) agreed between the Purchaser and Seller. 3.3.2 Method of Payment. All amounts to be paid by Purchaser to Seller pursuant to this Agreement shall be paid by wire transfer of immediately available U.S. federal funds. 3.4 Allocation of Purchase Price. Purchaser hereby acknowledges that Seller will allocate the Purchase Price among the Land, the Improvements and the Personal Property as set forth in Schedule 3.4 for state and local transfer tax purposes, and that Seller’s allocation is based on Seller’s best judgment as to the fair market value of the Land, the Improvements and the Personal Property, respectively. 3.5 Like-Kind Exchange. Notwithstanding anything to the contrary in this Agreement, Seller acknowledges and agrees that Purchaser may wish to acquire the Property as a replacement property in a transaction intended to qualify as a tax-free exchange under Section 1031 of the Code (the “Tax-Free Exchange”). If Purchaser elects to effect a Tax-Free Exchange pursuant to this Section 3.4, Purchaser shall provide written notice to Seller prior to Closing, in which case Purchaser shall enter into an exchange agreement and other exchange documents with a “qualified intermediary” (as defined in Treas. Reg. § 1.1031(k)-1(g)(4) of the Code) (the “Exchange Party”), pursuant to which Purchaser shall assign all of its right, title and interest (but not its liabilities or obligations) under this Agreement to the Exchange Party. Seller shall execute and deliver such documents as may be required to complete the transactions contemplated by the Tax-Free Exchange which are in form and substance reasonably acceptable to Seller, and otherwise cooperate with Purchaser in all reasonable respects to effect the Tax-Free Exchange. Notwithstanding the foregoing in this Section 3.4, the Tax-Free Exchange shall not diminish Seller’s rights, nor increase Seller’s liabilities or obligations, under this Agreement or cause any undue delay or any other adverse consequence to Seller as determined by Seller in its sole discretion and Seller shall have no liabilities with respect to whether the Tax-Free Exchange qualifies under Section 1031 of the Code or with respect to any other matter relating to the Tax-Free Exchange. Purchaser shall pay for all fees, costs and expenses in connection with the Tax-Free Exchange. If you purchase the Purchase Agreement featured on this page (the Qualifying Product Purchase Ageement), you will receive PA12101 Purchase Agreement Exhibit Sample Pack (90 single spaced pages) AT NO CHARGE as a free bonus. If you purchase the Purchase Agreement featured on this page (the Qualifying Product Purchase Agreement), you will receive PA12101 Purchase Agreement Exhibit Sample Pack (90 single spaced pages) which normally sells for $69.95 AT NO CHARGE as a free bonus.